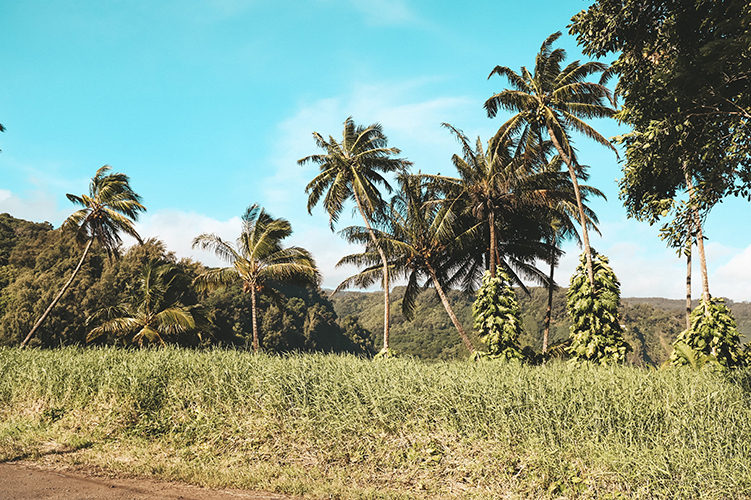 Honestly, Maui is so wonderful that you don’t really have to do much planning or research to find beautiful beaches or fresh local food. There is something incredible to see around every corner! Here I’ve compiled a list of where we stayed, ate and explored. Before any trip I like to star all the places I want to go on google maps. This way I can get a clear picture of where things are. For our first night in Maui, we stayed at a wonderful little AirBnB in Kihei called The Mango Tree Studio. It was clean, super cute and walking distance to the beach. We loved having a kitchen to cook in, make matcha in and relax in without having to see other tourists at every turn. I honestly wish I would have taken more pictures of the place because it was decorated to perfection. One of the highlights from our stay here was going for an early morning walk to admire the neighborhood charm. All the homes are unique, colorful and have yards filled with beautiful tropical flowers and fruit trees. If you’re traveling to Maui and would rather stay in an AirBnB instead of one of the big resorts, I can’t recommend this one enough! It’s perfect for a solo traveler or a couple. Next we headed to The Grand Wailea. This was probably one of the nicest resorts I’ve ever stayed at! It had everything you could ever want in a resort including an amazing gym, spa, a flower lei greeting upon arrival, free morning yoga, restaurants, beach access, multiple pools and even a lazy river. The service was outstanding and we really couldn’t have asked for more. 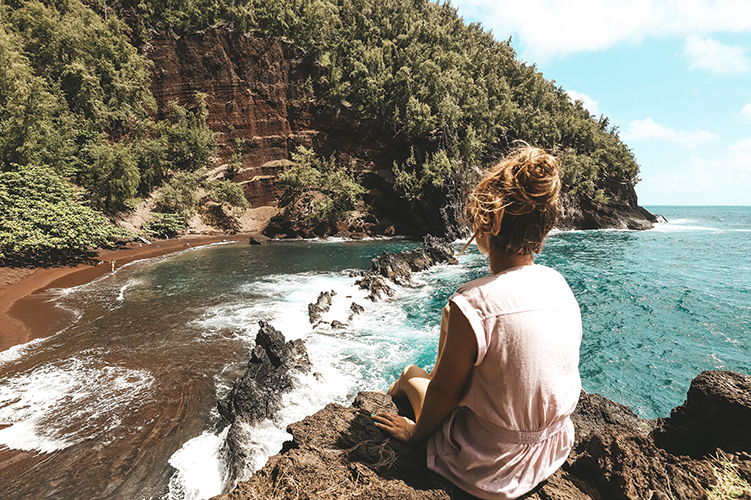 If you love a good outdoor adventure day then you MUST drive The Road To Hana while visiting Maui. If you want to drive the entire stretch it will take almost an entire day (depending on how many stops you want to make) but it’s a day well spent indeed. I recommend getting an early start. We hit the road at 6 am and even that didn’t give us enough time to see everything. We downloaded the Maui Shaka Guide App which uses GPS to give you turn by turn audio directions to each must see stop. The app costs about $8 but is extremely helpful and worth every penny. Below is a list of my favorite stops. 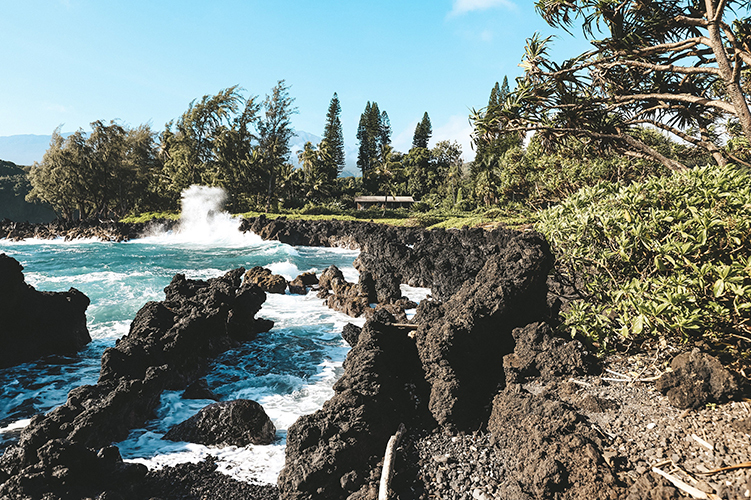 Ke’anae Peninsula - This was our first stop on The Road To Hana. We got out to stretch our legs, check out the old stone church and watch the waves crash on the rocks. I went for a little frolic in the field in front of the church to get my blood pumping before we got back in the car for more driving. It was lovely. Makapipi Falls- There are tons of beautiful waterfalls along the road to Hana. It would be almost impossible to see them all in one day, so we chose to stop at a few that are easier to access. Makapipi Falls was one of our favorites. It’s a very short walk from the road and we noticed that there weren’t many other tourists stopping here, definitely a win win! 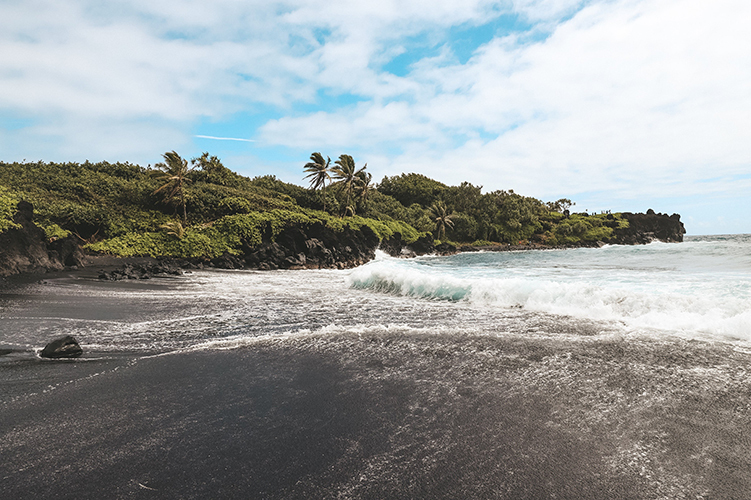 Black Sand Beach - Located in the Waianapanapa State Park, this black sand beach is a must see on the Road to Hana. We didn’t spend a whole lot of time here because it was quite crowded but it’s definitely worth a stop. Red Sand Beach - Making it to the red sand beach was on the top of my priority list for this trip. Pictures do no justice here. It was so beautiful I may have actually teared up a bit. Finding this beach can be a little tricky which is why I highly recommend getting the Shaka Guide App to get exact directions. Coconut Glen’s - Now this was a real treat. Roadside dairy free, vegan coconut ice cream. When we drove by on our way down it wasn’t open yet and I was worried that we wouldn't get to try it. Luckily they were open on our way back. I got the original coconut flavor and Nate got the lilikoi flavor. Both were spectacular! Koki Beach Park - Another beautiful beach that is easy to access. Lahaina Pali Trail - We loved this hike! I recommend getting there as early as possible. It was absolutely beautiful at sunrise. There is no shade on the trail so I can imagine it gets pretty hot mid day. This hike is about 5 miles round trip and moderately challenging. You’ll want sturdy hiking shoes for this because the trail is very rocky and uneven. At the top you’ll find breathtaking views and massive wind turbines. Very cool! 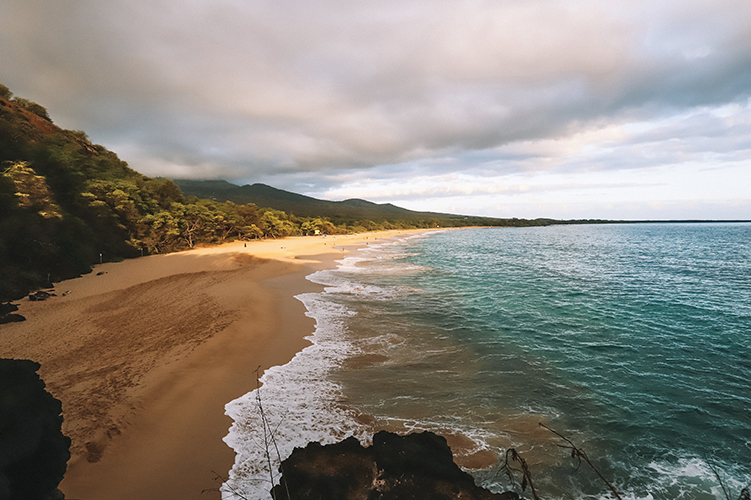 Big Beach - If you’re traveling to Maui you MUST watch at least one sunset at Big Beach. The water is crystal clear, the sand is soft and the beach is massive. You can easily find a quiet place to sit and watch without having loads of other tourists around you. There is also a cliff you can easily climb to see a beautiful view of the entire beach. There’s no shortage of fresh and delicious food options on Maui. After a lot of research and some great recommendations from you guys, I put together a list of must try restaurants. I am happy to report back that I made it to almost all of them and none of them disappointed! 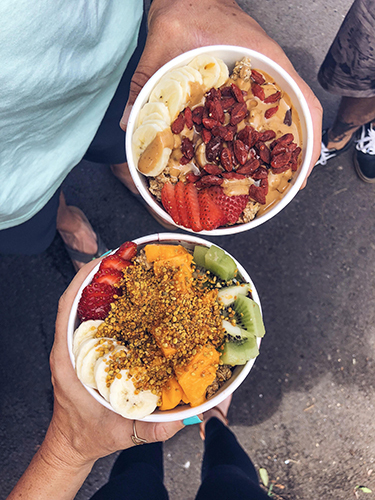 Baya Bowls - Located in Lahaina, this little food truck serves up fresh acai bowls and smoothies. I got mine with kiwi, mango and bee pollen and Nate got his with peanut butter and goji berries. a’a Roots - Also located in Lahaina, this cafe serves the most beautiful vegan dishes. Seriously, I wanted to try everything on their menu because it all looked so pretty! I got the burrito bowl which was massive and loaded with black beans, rice, veggies, cashew creme sauce, edible flowers and a generous serving of avocado (just how i like it). Alchemy - I had my favorite meal at this cafe and kombucha bar. Their fish tacos were INCREDIBLE! Everything is made fresh and the staff is super nice and friendly. The Mill House - This place blew us away! Located on the Maui Tropical Plantation, The Mill House is a farm-to-table restaurant using organic ingredients, many of which come straight from the plantation. It’s a good idea to make a reservation because it can get pretty busy. We were able to walk in without a reservation and get seated right away, but we arrived at a slower time (around 3pm). Their cocktails are a must try! Made with organic fruit juices and cold-pressed organic sugar cane, they’re refreshing, unique and only lightly sweet. Pretty much everything I look for in a good cocktail. 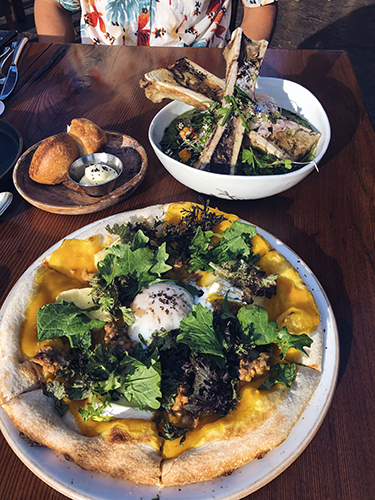 For our appetizer we got the chicken bao buns and for our main course we shared the squash pizza and the bone marrow with taro leaf risotto. Such a treat! Monkeypod Kitchen - Another great farm-to-table restaurant that supports local and sustainable organic farming with locations in Kihei and Lahaina. 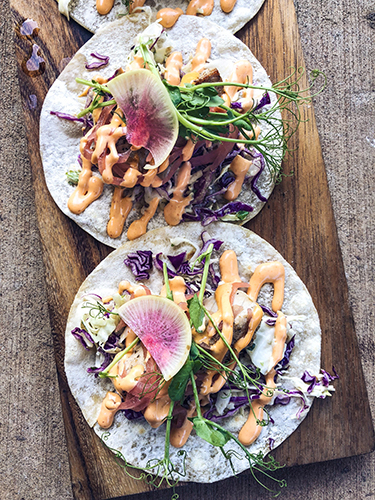 Get the fish tacos, the coco corn chowder and one of their famous Mai Tai’s. Down To Earth - This is our favorite health food store to visit while in Hawaii! They have an organic salad bar as well as a hot bar with delicious and healthy Hawaiian dishes. Not to mention all the healthy snacks you could ever want. We even found our favorite Eating Evolved Coconut Cups there! We stopped here before we drove the Road to Hana to grab a salad and snacks for lunch since there aren’t many food options along the way. Whole Foods - Located near the airport, we stopped here the first night to pick up ingredients to make dinner and breakfast the next morning (since we had a kitchen for a night we wanted to take advantage). We also picked up a few snacks and other essentials. We grabbed a ton of local fruit, veggies, potatoes, organic eggs, grass-fed beef, crackers, smoked salmon, almond milk and ice. Hawaiian Moons - Another local health food store located in Kihei. We stopped here to pick up some local produce. They also have a salad, juice and smoothie bar. 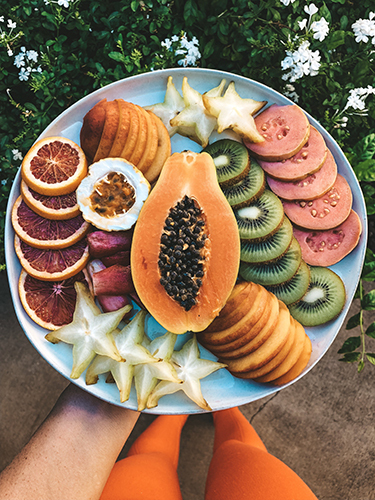 Choice Health Bar - Located in Lahaina and Paia, Choice serves fresh organic juices, smoothies, salads, sushi rolls and other locally made goodies. Akamai Coffee Co - Super cute and hip little coffee shop located in Kihei. Go here for the best matcha latte on the island! Barefruit Bar - This little shop serves smoothies bowls out of a pineapple! Enough said. ALL the local tropical fruits. So pretty! Everything I've listed here is pretty spread out location wise. 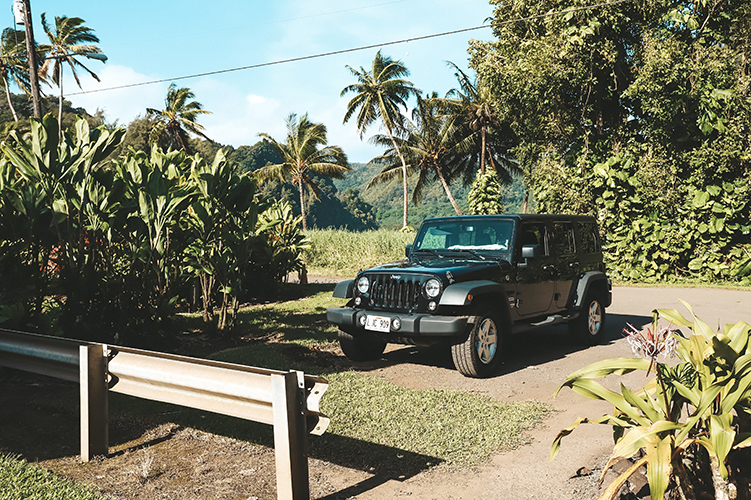 If you plan to do a lot of exploring, you’ll want to rent a car. We rented through Discount Hawaii Car Rental. They make the process super easy and the prices aren’t bad.